Equal pay scratches the surface of fair pay. Equal pay exists when one person is paid the same as another regardless of their gender, race, ethnicity, or other protected class. 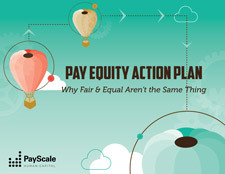 Fair pay can feel more elusive. Employees have a long memory when it comes to fairness. Once they get a sense that things are unfair, it can take a long time and a lot of work to overcome that perception. It’s better to work to prevent inequities before that sense of unfairness takes root. Ultimately, ensuring all employees feel fairly-compensated can help your organization win the war on talent and create a more diverse organization that drives business outcomes. Equal pay scratches the surface of fair pay. Equal pay exists when one person is paid the same as another regardless of their gender, race, ethnicity, or other protected class. Fair pay can feel more elusive. Employees have a long memory when it comes to fairness. Once they get a sense that things are unfair, it can take a long time and a lot of work to overcome that perception. It’s better to work to prevent inequities before that sense of unfairness takes root. Ultimately, ensuring all employees feel fairly-compensated can help your organization win the war on talent and create a more diverse organization that drives business outcomes.